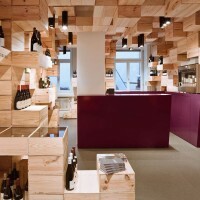 Swiss design firm OOS have designed the interior of the Albert Reichmuth wine store in Zurich. 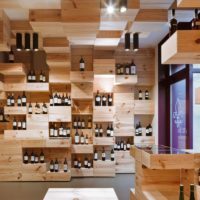 Always considered to be an insider’s secret among wine lovers in the past, the Albert Reichmuth wine store is now opening its first showroom accessible to the public at Feldstrasse 62 in Zurich. “LA GALERIE DU VIN” is both a sales as well as a wine tasting and seminar venue and aims to appeal to regular customers and passers-by alike. 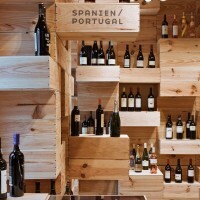 The spatial layout and staging by OOS reflect the store’s values and traditions and let the wine bottles speak for themselves. 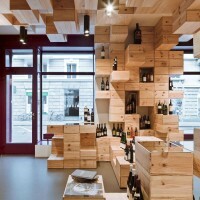 The intent of the interior design is to present an image of a landscape consisting of wine cases in which the high-quality wines are presented together with their cases as in a museum gallery. 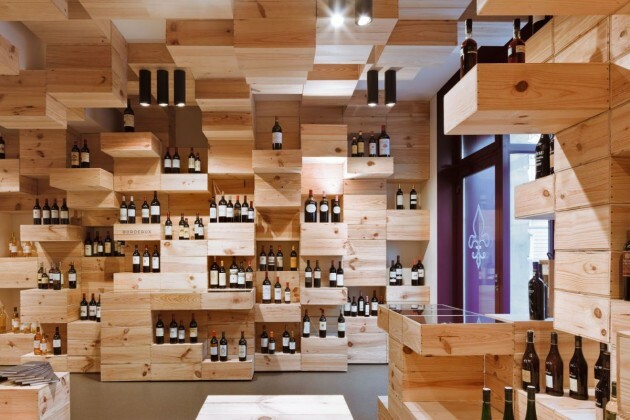 Some 1,500 unbranded wine cases from the Bordeaux region cover the entire room up to the ceiling, creating a cave-like environment. 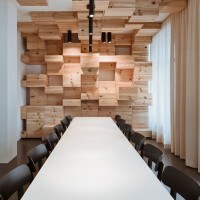 The wooden cases are simultaneously an architectural element and a part of the furniture. 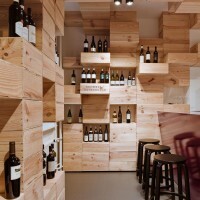 Arranged in a grid pattern they serve as a platform for about 570 wines, books, seating areas and illuminated table display cabinets. The mostly French wines are spatially divided into various geographical regions and groupings, which conceal specific histories, cultures and landscapes. The reception counter is located in the middle of the room – it is equipped for wine consultation and with its violet and ruby colours provides quite a contrast to the wood of the wine cases. The lights (Sommerlatte & Sommerlatte) on the ceiling formally illuminate the wine bottles and integrate themselves into the presentation of the bottles. Across from the sales venue’s showroom is a sitting room with a small kitchen. 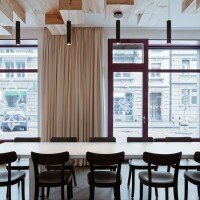 This section is used as the wine store’s reception room for tasting and seminars for up to 15 people. The spatial layout continues here and allows the cave-like wine-case landscape to slowly taper off. The wine collection depot in the inner courtyard has also received a facelift. With a light-coloured façade and new lettering on the walls, the building blends into the inner courtyard and incorporates the existing design elements of the Albert Reichmuth wine store’s corporate design. The Caspar, Poltéra advertising agency is responsible for the naming and signage design. Visit the OOS website – here.